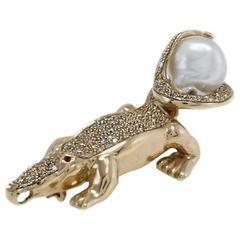 A baroque south sea pearl, white and colored diamonds, and 18 karat gold brooch/pendant, by Arthur King, 1970s. The brooch measures 2.56"H x 1.81"W and is signed King. Other measurements: south sea baroque pearl 0.70" x 0.50" mm & 0.65" x 0.50", colored diamonds approximate 3.00 ctw, diamond approximate 3.50 ctw. The chain is not available but we have a range of other chains. Arthur King was a renowned American, mid-century jeweler known for his naturalistic and organic use of gold, paired with gemstones such as pearls, diamonds and other crystals in their raw, natural forms. 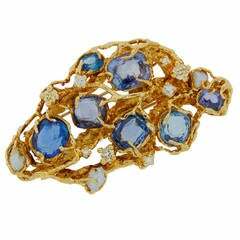 A highly collectible jewel. A diamond, coral, turquoise and 18 karat gold brooch, by Arthur King, c. 1970. Stamped King, 18k. 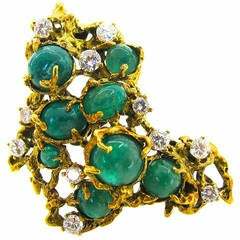 Large 18k gold free form brooch, crafted by Arthur King, set with three turquoise, and approx. 0.52ctw in G/VS diamonds. Brooch is 60mm x 58mm and weighs 77.7 grams.